There are two established areas for bars in the 19th Ward. 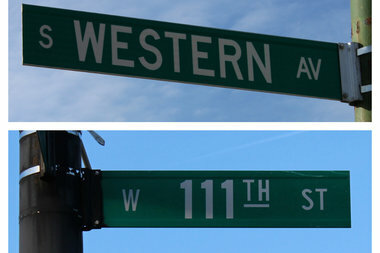 The better-known strip runs along Western Avenue from 99th to 119th Streets, spanning both Beverly and Morgan Park. Another collection of bars is concentrated on 111th Street in Mount Greenwood. BEVERLY — Those brave enough to attempt to stop at every Western Avenue bar in Beverly and Morgan Park ought to set aside plenty of time. There are 20 places to grab a drink between 99th and 119th Streets on Western Avenue, according to map compiled by DNAinfo listing all licensed liquor establishments throughout Chicago. In fact, there are actually 23 places that can legally serve liquor along the route that cuts through the 19th Ward. But Mrs. O'Leary's Dubliner in Morgan Park is closed as new owners are being sought. The Beverly Arts Center only serves booze at special events, and you can't get a beer in Smith Village unless you are a resident or guest of the Morgan Park retirement community. Regardless, the idea of hitting every tavern along the route has taken several names, including "The Western Avenue Death March" or, in a testament to heavily Irish Catholic flavor of the area, "The Irish Death March" and even "Stations of the Cross." That said, if you spent 15 minutes drinking one beer in each establishment, it would take exactly five hours to tackle all 20 bars along the route. After that, a 150-pound man would have a blood alcohol content of 0.457 percent — well beyond the legal driving limit of 0.08 percent in Illinois, and perhaps enough to kill you — upon competing said route in this amount of time, according to The Original Blood Alcohol Calculator website. Perhaps a more feasible goal would be to tackle the 11 bars along 111th Street in Mount Greenwood instead. This would only take 2 hours and 45 minutes if you were to spend 15 minutes having a beer in every bar beginning with Hippo's at 3011 W. 111th Street and ending on the Southwest corner of the city at TR's Pub, 3908 W. 111th St.
You should still get a ride home though. The online blood alcohol calculator says the more modest march down 111th Street would still put you at 0.251 percent, a blood alcohol level more than three times the legal driving limit in Illinois.